How Much Water Should We Really Be Drinking? We’ve been told since we were kids we should be drinking eight glasses of water a day, but how many of us actually follow that rule? Whether you’re a water lover or someone who prefers to gulp down Diet Coke all day, proper hydration is beyond important for keeping our bodies and minds functioning correctly, but there’s no “standard” of how much water everyone should be drinking. In fact, the ideal quantity of water varies from person to person. Here’s how to make sure you’re getting the amount of water you need. Find out how much is “right” for you. The quantity of water needed daily depends on several factors, such as your weight, the climate you’re in, and your activity level, says health coach Michele Periquet. For a better idea of how much water you should be drinking, multiply your weight in pounds by two, then divide by 3—the resulting number is how much you should be drinking in ounces daily. This should be increased if you work out, are in a dry climate, etc. One sign that you are properly hydrated is if your pee is colorless or very pale yellow. Be aware, though, that certain supplements like vitamin C may affect the color and make it appear darker or brighter. Start your day on the right track. Start the day right by drinking a tall glass or two of water right when you get up, before the coffee and anything else you might consume in the morning, says Periquet. Drink water 15-30 minutes before and after meals, as drinking water during meals can interfere with proper digestion of food, says Periquet. 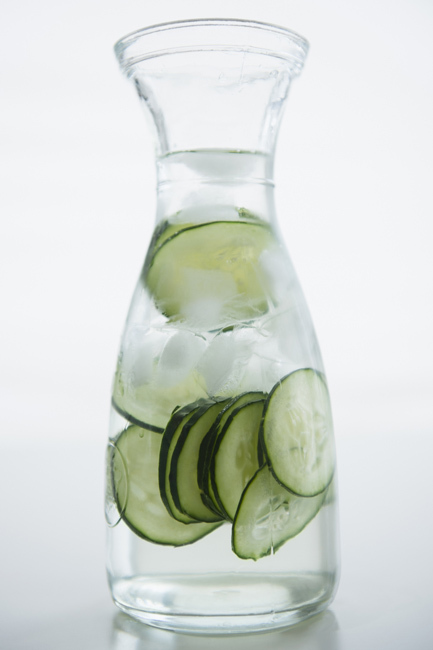 If you find drinking water boring, adding mint leaves or slices of fruit will infuse a delicious natural flavor. Sparkling water is also great for variety. Jay suggests carrying around a glass or BPA-free plastic bottle of water around with you that you can leave on your desk—it’ll remind you to drink throughout the day. For those who drink coffee or wine, make it a habit to drink two glasses of water after each cup of coffee or glass of wine. It helps to counteract the dehydrating effects of these beverages. Simply sipping water throughout the day keeps the water in your blood stream without prompting frequent trips to the bathroom, says Maggie Moon, MS, RD, owner of Everyday Healthy Eating. Consume foods with high water content. Some of Moon’s favorites are all more than 90-percent water: Try cucumbers, cabbage, celery, lettuces, tomatoes, radishes, zucchini, summer squash, sweet peppers, broccoli, cauliflower, melons, grapefruit, watermelon, and strawberries. There are at-home carbonators that make bubbly water environmentally friendly. Add an ounce of 100% juice, then fill the rest of your glass with sparkling water, says Moon. Recent studies have shown that being even just slightly dehydrated can increase feelings of anxiety and depression, and lead to trouble concentrating, says trainer and nutrition expert Kori Lyn Angers. You don’t have to be running a marathon in Death Valley to be dehydrated. As we’re going about your day, or even just sitting at our desks, water evaporates through our skin into the air at a constant rate, making it possible to become dehydrated without knowing it. After working out, using a sauna, or any activity that makes you sweat, remember to drink more water, says Periquet. If you have a headache, try drinking two glasses of water first before taking a painkiller. Sometimes headaches can be a symptom of dehydration.